I am filing this in the Success with Art folder. Take a look at this picture. Sorry, that I am unable to offer the artist a credit because he or she is so well deserving. I am proud to relay information about events and exhibits like this. So, please send my way! Artwork, including this watercolor, by art students from the Warrenbrook Senior Center, will be on display for May and June at the Warren Township Library. There will be a reception on Thursday, May 15. WARREN TWP. – The Warren Township Library in conjunction with The Warrenbrook Senior Center/Somerset County Office on Aging & Disability Services will be hosting a one-hour reception at the Warren Library, for the Warrenbrook Senior Center art students at noon on Thursday, May 15. Warren Township Committee members, the director of the Warrenbrook Senior Center, library administrators, as well as the artists and their families, are expected to be in attendance. Ralph Garafola, portrait artist and Warren resident, has been invited to say a few words at the reception. In January 2013, the first art class providing instruction in painting with watercolors was offered at Warrenbrook. Robin Kaufman, a former volunteer at the Warrenbrook Senior Center and a graduate of the Summit School of Fine Arts, taught the watercolor class during its inaugural year. Under Kaufman’s tutelage, students who had never picked up a paint brush became artists, painters who had not painted in years began painting again and skilled painters found an opportunity to hone their skills. Due to the popularity of the class and a huge waitlist, Warrenbrook had to quickly add a second class to the schedule. 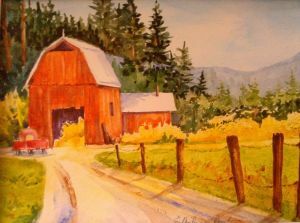 The artwork is expected to be on display in the adult services reading room at the Warren Library for the months of May and June. The public is encouraged to stop by during library hours to view the progress these seniors have made in the last year.